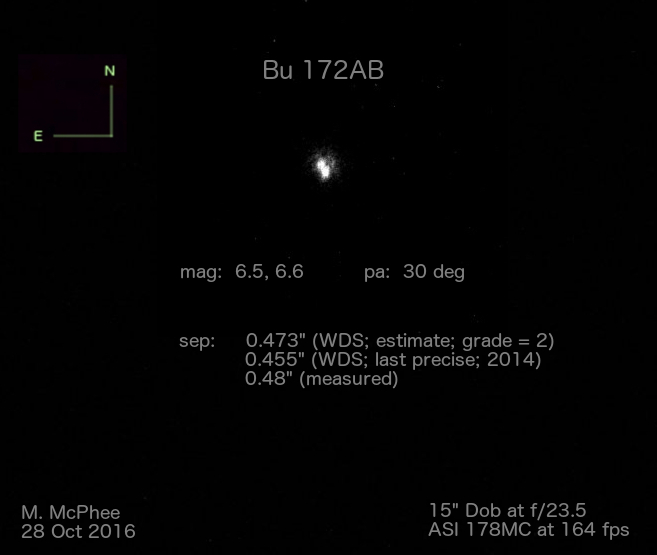 This report details my visual and photographic observations of some sub-arcsecond double stars that have been the subject of a few CN threads the past few months. This document is necessarily heavy on technical details to support those who may wish to independently evaluate the results. Visual observations were made with a 15-inch f/4.5 Dobsonian reflector setting atop an equatorial platform. 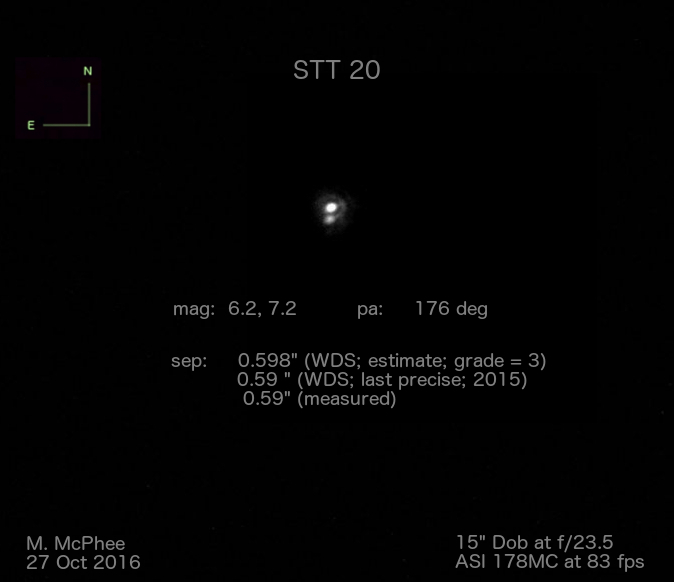 All observations were made between September 26th and October 26th of this year with a Paracorr Type I lens (setting no. 1) in the optical train. In all cases, Pentax lenses were used to achieve the following magnifications: ‘low’ (5XW; 398x), ‘moderate’ (3.5XW; 569x), and ‘high’ (2.5XO; 798x). Imaging was accomplished using an ASI 178MC cooled camera [AVI files; mono mode] in an optical train consisting of a Paracorr Type I lens (setting no. 5) and a 5x Powermate. The plate scale for imaging was previously determined to be 0.0553 +/- 0.001 “/pixel using calibration stars (n = 10) and 0.0553 +/- 0.002 “/pixel using a diffraction grating with monochromatic red light (n = 8). Sharpcap 2.8 was used as the image capture software. Fine focus was achieved using a Bhatinov mask [All-Pro, Spike-a brand] modified to fit over the Obsession UTA. Separation values were determined using REDUC. Images were stacked and processed using Registax with final presentation formatting in Gimp. The separation data are not in good agreement for this object. This is, therefore, a good candidate for quantitative scrutiny. At 398x the object vacillated on the border between elongated and just resolved to two golden-orange disks of similar magnitude in the correct position angle; 569x proved sufficient to show the stars as different magnitude and clearly resolved (but not yet split); a final increase in magnitude to 798x showed the pair as split, again with a golden-orange color and a small difference in magnitude. The ease of resolution at modest magnification led me to think the larger separation value [0.575”] was more accurate for Bu 720. 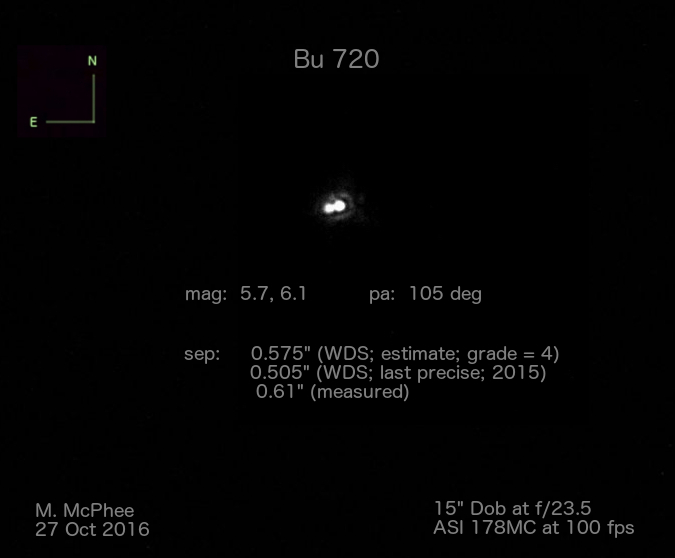 Bu 720 was easily imaged using an exposure of 10 ms [gain = 320]. Four movies were made and separation was measured by three methods using REDUC: cross correlation of the top 5% of frames using S4 filter; simple measure of a Registax composite; and simple measure of a composite generated in REDUC. There was good agreement across these methods, giving a measured separation of 0.61”. Edited by Nucleophile, 24 December 2016 - 01:32 AM. This is a challenging target made a bit easier due to the similarity of star magnitudes. STT 495 was imaged with some difficulty using an exposure of 21 ms [gain = 400]. Two movies were made and separation was measured by two methods using REDUC: auto correlation of the top 10% of frames using S4 filter; and simple measure of a Registax composite. There was good agreement across these methods, giving a measured separation of 0.39”. Edited by Nucleophile, 24 December 2016 - 01:33 AM. Good agreement between WDS listed separation values. Should be able to split at high magnification on a night of good seeing despite the components being on the ‘bright’ side for the 15-inch mirror. Moderate magnification (398x) showed the system as elongated to slightly notched. Upping the power to 569x afforded an image of two evenly matched white stars that were barely resolvable as separate discs. Employment of high magnification (798x) made it easier to see the discs as resolved, yet substantial overlap still existed preventing a true split. A very challenging target visually for this night when the seeing was rated as merely a 3+ out of 5. Bu 172AB was imaged using an exposure of 6.1 ms [gain = 370]. Two movies were made and separation was measured by three methods using REDUC: auto correlation of the top 10% of frames using S4 filter; simple measure of a Registax composite; and simple measure of a composite generated in REDUC. There was good agreement across these methods, giving a measured separation of 0.48”. Good agreement between WDS listed separation values. Should be able to split at moderate magnification. Low magnification (398x) shows two white stars that are clearly resolved and are oriented in the position angle as stated in the WDS. Moderate magnification (569x) shows that the components possess dissimilar magnitudes; the pair was barely split about 20% of the time at this power. STT 20AB was imaged using an exposure of 12 ms [gain = 400]. Four movies were made and separation was measured by two methods using REDUC: simple measure of a Registax composite; and simple measure of a composite generated in REDUC. There was good agreement across these methods, giving a measured separation of 0.59”. REDUC Correlation methods were not useful with this target for producing separation values because of the faintness of the secondary. This target possesses a wide discrepancy between WDS values and was discussed at some length in a prior CN thread. This object was observed as split using an 8-inch reflector at 340x (3.5XW lens). 16 VUL was imaged using an exposure of 14.5 ms [gain = 450]. Four movies were made and separation was measured by three methods using REDUC: auto correlation of the top 5% of frames using S4 filter; stacked REDUC reductions; and simple measure of a composite generated in REDUC. There was good agreement across these methods, giving a measured separation of 0.771 +/- 0.006”. Previous REDUC autocorrelation measurements of this system using a 2x Powermate [plate scale = 0.143 “/pixel] gave a measure of 0.78 +/- 0.02”. Jaw dropping images. Well done. The biggest problem with last precise measure is that rather often it's not precise - simply the most recent measure published in acceptable science journals. Some doubles are being over- often measured, others neglected, and the popular ones especially attract attempts of greatly varying accuracy. That showed spectacularly with 16 Vul and the range of numbers for particular eras. Even using speckle interferometry - the gold standard if done well - produces less than consistency because some observers don't seem able to make optimal use of the technique. Of course this is true of other methods as well, but they don't have the same accuracy potential. Next best - and better suited to moderate apertures - is lucky imaging, as done here. As Rainer Anton showed with his work published a few years ago in the JDSO it can give results close to speckle. With these particular close doubles it will be interesting to see how the numbers above compare with good speckle work if someone does it near this date - it's possible that's already happened, but the results are either not the currently most recent or are not yet published. For the professionals, one important task is evaluating the quality of measures, on the way to an orbit calculation. Meanwhile, well done with the above work. Mark: Outstanding images and analysis of the results. 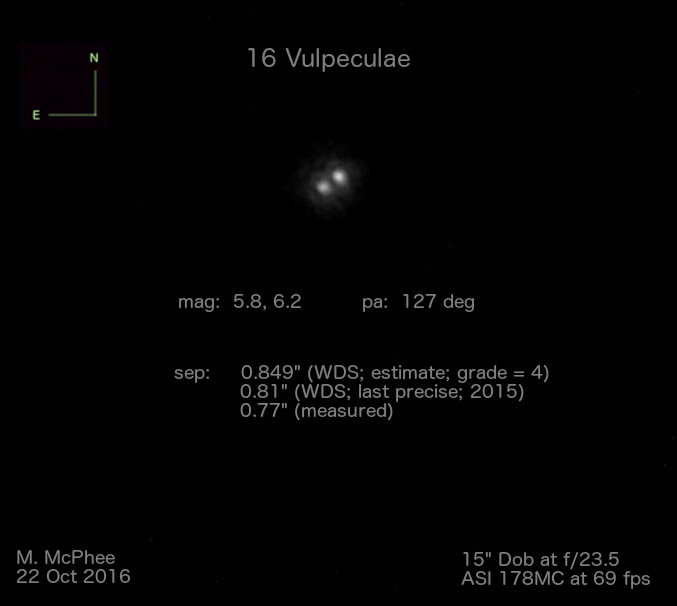 I use "speckle" in shudder quotes because most of us use scopes that are too small to gather many true speckles, although a 15" might very well be at the bottom end of true speckle imaging. However, "pixel autocorrelation" (my term) seems to work just fine, opening the opportunity for smaller scopes to get into the "speckle" business. The best way I found to access how you are doing is to compare your results with the history of observation with an analysis of relative motion. I have found some recent measures, supposedly " precise" to be off the trend line while others are on the trend line. Perhaps more important, taken as a whole there is good scatter above and below the trend line, indicating that deviations from the model are random. If you are luck enough to have a lot of measures in the Fourth Catalog of Interferometric Measurements of Binary Stars, then these are the measures to compare to a good model. This has its drawbacks. You are comparing a rectilinear or orbital solution with your observation and that means you are comparing a model with data. The purpose of a model is to predict future data, so that is not a bad thing, but it is, in the end, "just"a model with its own set of errors. On the topic of errors, along with centroiding, you also have a shorter baseline on close pairs with the same measurement granularity. "Pixel autocorrelation" seems to help on the centroiding, tightening the spots, at least in my experience. Autocoreleation gives 3 spots and a 180 degree ambiguity. Measuring the angle across the result (i.e the 2 outside spots) may also help reduce errors, but that's speculation at this point. Mark, you might like the drift calibration in the Speckle Tool Box, Yahoo "Speckle interferometry" forum. thanks, Greg. I have the Tool Box; it is next on my 'to learn' list over the holiday break. I want to see how it compares/complements REDUC. Greg wrote: "Measuring the angle across the result (i.e the 2 outside spots) may also help reduce errors, but that's speculation at this point." Greg: I tried this for STT 20 and I still get an erroneously high value for rho. I don't have a great feel yet for why autocorrelation is not useful for some of these doubles--certainly, I use it whenever I can and it is what I use on calibration stars when determining plate scale. In particular for STT20, what worked best was to generate a composite (either using REDUC or Registax) and perform a manual centroid location using the smallest sample box size (3 x 3). The contrast and brightness need to be adjusted first using this method to locate the brightest pixels. Edited by Nucleophile, 24 December 2016 - 06:18 PM. I'm not questioning your methods, but I am curious, if you view/image these doubles on axis, is the Paracorr necessary? Or does the Paracorr allow you to image multiple doubles (off-axis) at one time? I try as best as possible to observe and image on-axis. However, this is not always possible photographically, particulary with the narrow FOV at f/23.5 using the ASI 178MC-- I am lucky to have the system anywhere in the FOV for capture before its inevitable drift out of the the field. I have noted on numerous occasions the benefit of using a Paracorr lens to afford sharper images both visually and photographically--even when on-axis is achieved. I am a big fan of the use of the Paracorr lens with my reflectors, although I do leave it out sometimes for specialized viewing (such as TDS systems, for example). 1) If you are starting at f/4.5 makes getting to f/15 or higher is pretty sensitive to any shift in geometry. "The plate scale for imaging was previously determined" gives me a little pause, hence the suggestion for the use of Drift Calibration. Make sure to check with each filter too.... IMHO It's good practice to check plate scale any time the optical train has been reassembled if not before and after each session..
2) Be careful with color cameras. I use monochrome and would suggest one if you are really getting into measuring doubles. However, there has been a comparison done and I think the final conclusion was color cut the resolution by about 33%. My starting point is to multiply the linear pixel size in microns by 5. So 2.4 x 5 = 12, times 1.5 gives 18,,, I would start with ~ f/18 and go as high as f/24 for really close doubles and to f/15 or so for faint but wider pairs. The f/# is chosen to manipulate the Airy disk, not specifically for plate scale. 3) I continue to get very good reports on the IMX290 based cameras and the IMX178 should also be very good. My cooled ASI290m is still a virgin, but the sky's here in the Pacific NW will eventually clear and I will give a firsthand report. Again, my preference is monochrome. I also have had better luck using the full bit resolution of the camera (12 bits for the 290 and the Skyris 618). I use FITs format and Firecapture. Also note the ASI 290 has a max analog gain of 350, beyond that is digital gain which offers no benefit, sorry, not sure about the 178. I use Reduc for most things so far but am trying to migrate to the Speckle tool Box. IMHO Reduc is easier, STB has more control and more options. Just Rambling, maybe something you can use. mark: beautiful, careful work. exceedingly well done. "kudos", and any other relevant salutation of praise from beyond the border walls. i also want to highlight in fluorescent orange marker pen your repeated testimony that increasing magnification is useful in visual double star astronomy. my guidance is, if you still can't detect or resolve a pair and can contrive to use a higher magnification -- then use it. about burnham i have one thing to say: **** you, burnham! his and otto's catalogs (excepting otto's late entries) are a compendium of tough nuts to crack. your measures seem to impugn the catalog accuracy of two pairs, STT 395 and BU 720. i suggest you are mixing your standards here. it's one thing to have guidance to a visual identification, and it's a completely separate thing to contribute to the relative positional measurements that can produce astronomical insights about physical processes. in the visual case, CDSA2 quotes 0.8" for the separation of STT 395, and it's hard to see how that is misleading either against the most precise catalog value of 0.849" or your measured 0.77", which both end up being 0.8" in single decimal places. this is the only way we can distinguish among the two basic possibilities -- bad orbital solution, bad measures. according to the standard of astronomical insights we have only to thank you for your effort, we put your data point and epoch in with all the other data points from all the other epochs of fallible observers with their diversity of sensor captures, software processes and measurement methods, and we try to make sense of the whole. by the way, your finding of a quibble with STT 395 is yet another illustration of my contention that double star astronomy is a solar neighborhood astronomy: CDSA2 quotes the distance to STT 395 as about 70 parsecs, practically a star hop in the scale of galactic dimensions. in contrast, your average 11th magnitude solar type star will be almost 200 parsecs distant, and the 0.8" projected separation will amount to a minimum orbital radius of 140 AU and a minimum orbital period of 1200 years. where i hope double star astronomy is going is toward something akin to the messier list. in the same way that deep sky astronomers know the messier objects (including the bogus objects) as a particular sample of all the deep sky objects out there, i think double star astronomy is moving toward a selection of the physical systems that can be reasonably well measured and studied, among all the "systems", including optical pairs and pair asterisms, that clutter and pollute the double star literature. 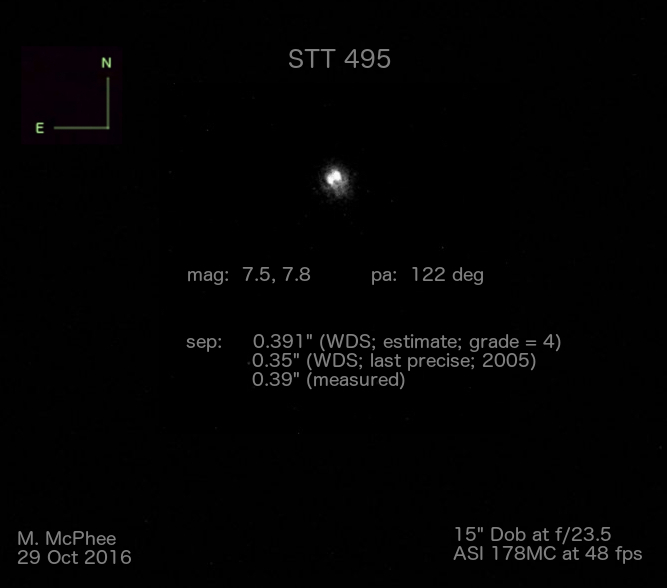 eventually we will refer fondly to STT 395 or BU 720 in the same way we talk about M 42 or M 31 -- familiar objects, increasingly well understood, that have something important to contribute to astronomy. Thanks for your input, Bruce. I read your asterisks as "thank" as in "thank you, Burnham!" I say this because these are my favorite targets to view because they are nearly always challenging; STT doubles are a close second, though. When examining plate scale using the diffraction grating on multiple nights, I have no witnessed no discernible change. However, I agree best practices would be to include some assessment/validation during a night of measuring runs; hence, the Drift Calibration suggestion sounds like a prudent and expedient approach. In the analytical chemistry world this it is standard procedure to validate the analysis protocol prior to processing of samples. To date, I have found no improvement using REDUC when FITS files were used versus BMP files--but this is only a cursory conclusion. Also, BMP files can be stacked in Registax. I understand FITS is the preferred file format for STB--so, I will make an attempt to understand and use this format in greater detail, e.g., generating a 'FITS cube' whatever that is and however that is done. As always, I appreciate your suggestions, Greg. Good job. Only thousands upon thousands to go. Missed the "diffraction grating", about as good as it gets for separation. IMHO, drift Cal is better for base angle and a good secondary check for rho. Using binary stars to calibrate an imaging system used to measure binary stars is not the best strategy. The WDS itself warns against doing so. Circular! I used calibration stars for measures I made in 2014 and 2015* (because I didn't know any better at the time) and am currently writing the article up for publication in the WDS. 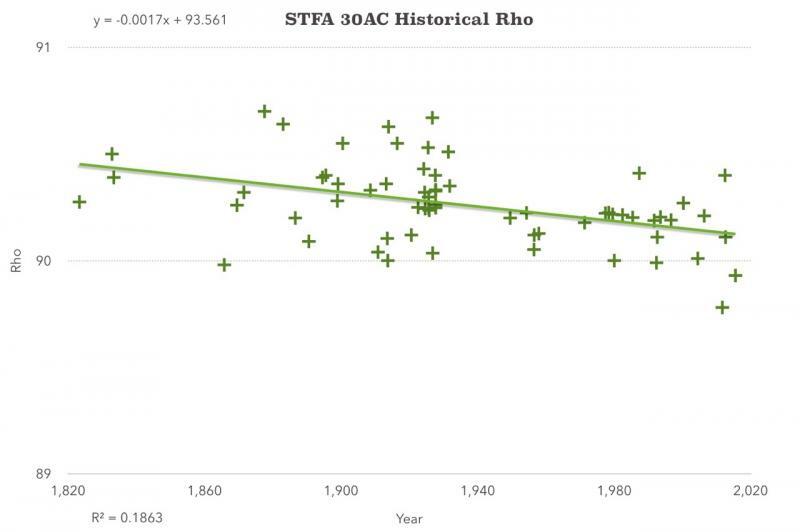 For calibration of both Theta and Rho I found 12 wide pairs around the sky with virtually zero change in Rho and Theta since discovery. The scatter graphs of all 12 pairs look, more or less, like the graph below. The measures show significant scatter. In the case of STFA 30 AC the WDS "Last Precise Measure" is given as 89.93". Just looking at the graph one can tell that 89.93" is almost certainly incorrect and, if used for calibration of plate scale, will engender erroneous results. The most modern measures have a spread of +/- half an arc second!!! And, believe me, the other 11 'motionless' pairs** of mine show a similar spread in the historical thetas and rhos. Sometimes the 'Last Precise Measure' is right on the regression line but not always. *I'm not using calibration stars any more, btw. **I am 100% aware that these pairs may or may not be optical illusions or co-moving pairs or rectilinear or whatever. Don't care. I'm just concerned with their measurement and their utility as calibration tools here. Were you ever able to source a sturdier diffraction mask? I recall some discussions over on the DIY board with some folks who had the means, but I don't know if anything came of it. Yes. I have aluminum ones now 6mm and 12mm pitch. They work a treat!! By chance, I revisited 72 Peg with the 8 inch reflector last night. I was pleasantly surprised to see the two off white stars as resolved. The image was a classic snowman shape with one star a bit smaller than the first and in the correct position angle [similar to the image at the top of the post but with much less separation of the components]. I was operating at 480x with a Pentax 2.5XO eyepiece. As I did not have my tracking platform installed, the double rapidly transited the constricted field of view. After numerous drifts I was confident in what I saw. I would be keen to hear of any other observations of this system. On a final note, Bruce M. notes in the CDSA (Vol 2) the B component is also a double with the stars separated by less than 4 AU.